The decision to leave the settled and well-established cities of the American East Coast in the mid-19th century was one that millions made with trepidation. There was no guarantee of success or even a long life by moving west, but there were still plenty of Americans and newly-arrived immigrants who took that gamble. It should come as no surprise that gambling became a popular recreational activity of the era given the gambling nature of those moving to the Wild West. Right now, 1 oz Antique Silver American Western Skulls Gambler Rounds are available to purchase online at Silver.com. Ships to you inside of protective plastic capsules with a Certificate of Authenticity included! Seventh design release in the American Western Skulls Collection! Obverse includes the design of a Gambler. Reverse features the fried eagle common to the American Western Skulls Series. Individual serial number on the round’s edge. 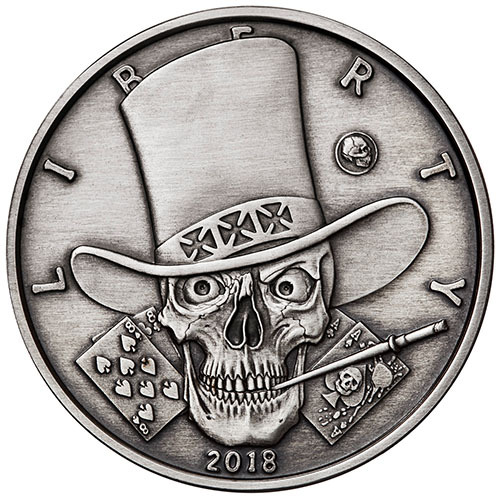 Each of the individual 1 oz Antique Silver American Western Skulls Gambler Rounds in this listing comes to you with a protective plastic capsule to house the round and a Certificate of Authenticity with its unique serial number. 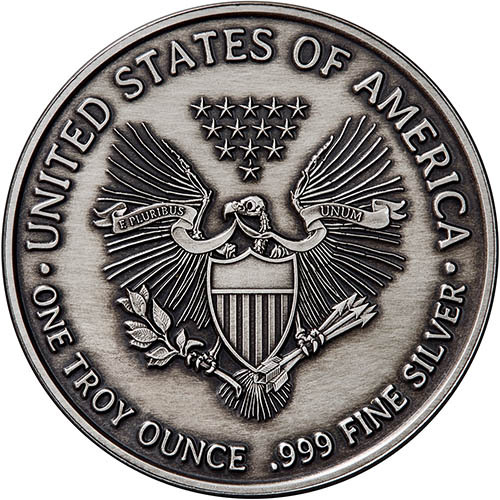 Those individual serial numbers from the round’s edge are found on the COA itself to match the two together. The Gambler design is the seventh character to feature in the American Western Skulls Collection. The series explores the deadlier side of the often-romanticized Wild West. In truth, the Wild West was a lawless place where outlaws terrorized innocent settlers and indigenous tribes fought back fiercely against the encroachment of Americans and Europeans in hopes of defending their homeland. On the obverse of the 1 oz Antique Silver American Western Skulls Gambler Round, you’ll find the skeletal figure of a gambler. This individual wears a tall top hat and smokes a cigarette as he gazes at what turns out to be the Dead man’s hand. The aces-and-eights hand was purportedly in the hands of Wild Bill Hickok when he was approached from behind in a saloon in Deadwood and shot dead on the spot. The reverse of Antique Silver American Western Skulls Gambler Rounds includes the design known as the fried eagle. Based on the heraldic eagle of the United States, this design retains the triangular cluster of 13 stars and the heraldic shield of the country. Rather than a powerful bald eagle though, you’ll notice just the skeletal remains of the bird. If you have any questions, please don’t hesitate to contact Silver.com. Our customer service team is available at 888-989-7223, online using our live chat, and via our email address. Don’t forget to check out our silver spot price charts to stay up-to-date on changes in silver!